In the heart of New Buffalo, this fantastic home is located in a quiet neighborhood close to the marina, the beach and downtown shops and restaurants. The main house has two levels. On the main level, guests step into an open concept living area with comfortable seating around a large flat screen TV and gas fireplace; a dining table with seating for 6; and a spacious kitchen with new appliances and plenty of counter space. Around the corner from the living area guests can take advantage of a private study, or step outside onto the deck. Down the hall from the study is a powder room and laundry area. On the other side of the living area is a spacious master bedroom with full bathroom en suite and a large walk in closet. On the upper level are two bedrooms and another full bath. The smaller bedroom includes a queen size iron bed. The larger bedroom features a semi-private area with two twin beds and a larger area with a king size bed, a large cozy leather chair and a flat screen TV. There is also an additional twin size bed located in an alcove. The separate cottage sits next to a creek which runs alongside the property. It has one bedroom with queen size bed, a full bath, kitchenette with microwave, television, and a DVD player. Surrounded by mature trees on 2 sides and a creek that runs down the southern edge of the property, privacy is key for this home. There is a sweeping grassy back yard for outdoor games and activities. 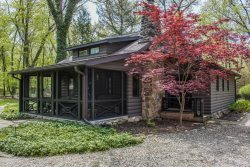 Or you can just sit back and relax on the wraparound deck of the cottage, the porch swing by the creek, by a roaring fire in the fire pit, or enjoy a soak in the new hot tub. This home is perfect for large family gatherings or groups looking for peace and quiet while still being close to the main attractions New Buffalo has to offer. Please note that we accept weekend rentals during the non-summer months as well. Hot Tub is open year round! Jon made booking the property incredibly easy! He offered suggestions on houses we could book based on our needs and took care of everything right over the phone. loved: The amount of beds and the open concept of the first floor. Walking distance to downtown new buffalo. This is our second stay at this property. We enjoy it thoroughly. I mentioned some very minor tweaks, but besides those we found the stay to be top notch. We have stayed at the As Good as it Gets property for several years now and we will come back every year. The house is perfect for our large group, it has everything we need including amenities and ample space! The staff is always a pleasure to work with and the pricing is spot on! Everyone was friendly and easy to deal with. Don't change a thing! We have been visiting New Buffalo for 8 years now on a yearly basis. The As Good as it Gets property is perfect for our group of 10! Close to everything, plenty of room inside the house for the group- we couldn't ask for anything else! Then you add the professionalism of the staff- perfect! Everyone was great. All questions were answered ASAP. Each person I worked with was great and very responsive. I believe I booked with Jon and dealt with Dan for check in and check out. Great experience! All of you were wonderful, very responsive. I spoke to Ana, and then Dan came to the house to show us how to operate the shower. Very helpful people, and for sure we'll be in touch next year. we'll do it again! Great property, plenty of room, nice amenities, and we got a discount because of the timing of the weekend, which was great. Favorite part of the property was the secluded feel to the house and large backyard for the kids to play. Very nice small creek ran along one side of the property. Very nice. Jon and Anna were great to deal with. We had many questions about which house would fit our needs the best. He directed me to several options that fit our criteria and we chose from there. Very upfront about all the costs, etc. House worked very well for our family. We really enjoyed the sense of privacy there and being able to walk to many businesses in downtown. Very much enjoyed walking to the Joe's for coffee and sitting on the rooftop overlooking the marina and lake. The cottage was great for the grandparents to be at the property but also have their own personal space when the kids become overwhelming. Jon was great to deal with. They answered all the questions we had about the house and the area since it was our first time to the area.